ISHPEMING — The FIRST Tech Challenge teams from around the U.P. 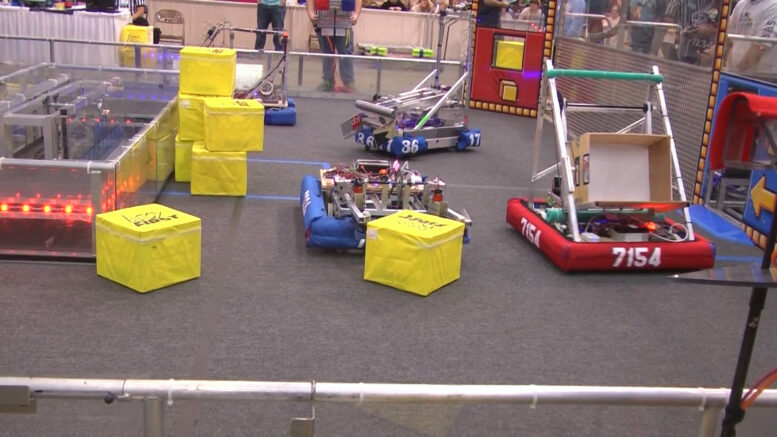 will gather at Aspen Ridge Elementary school for a robotics scrimmage this weekend. This is the first year Aspen Ridge is participating in the FIRST Tech Challenge. This new program is geared towards students in grades 6 through 8. The scrimmage is held for students to get an opportunity to learn more about competitions and gain more skills. “We just gather together to go through what a competition is going to be like as we prepare for our competition at the end of November. The kids are going to get together, theyre going to run their robots and work on programming, they’re going to go and talk to some judges. It’s just to get the kids ready for what a competition would be like and what to expect,” said Kristen Grondz, Lead Coach for Middle School Team. “Team building is a big part of this and being nice to other people and showing kindness to other teams and helping is a big part of it. If you don’t work together, then you can’t get all of this accomplished,” said Patrick Klump, 7th Grade Robotics Team Member. “I’m excited to see all the different teams and what they’ve prepared for this Saturday,” said Gabe Grondz, 6th Grade Robotics Team Member. The scrimmage will take place from 10 A.M. – 5 P.M. on Saturday at Aspen Ridge Elementary in the gymnasium. The community is encouraged to come watch the scrimmage and see what it’s all about.